Magic London Carpet Steam Cleaning Fitzrovia W1 is a professional cleaning agency that specialises in providing optimum carpet cleaning services to the citizens of London. We use modern equipment, recommended and by the industry. Our Cleaners are experienced and well trained. We have customer satisfaction guarantee or re-clean. Call us on 0208 861 0979 for more information. Two techniques are used in carpet cleaning industry: steam carpet cleaning and dry carpet cleaning. The most common one is steam carpet cleaning or hot water extraction. In steam carpet cleaning, we first apply a pertinent stain remover to ensure the best results. After the stain remover application, the entire carpet is then steam cleaned. The hot water extraction technique uses powerful cleaning machines to remove stains and dirt and moisture from the carpet. We also employ the dry carpet cleaning technique which involves the use of spray and powder products to clean delicate upholstery and carpets. 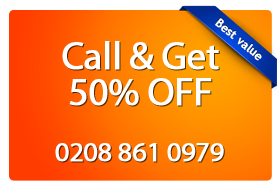 Call now on 0208 861 0979 to book a service. Our customer support assistants are ready to help you with every question you have. We keep our phone lines open anytime of the day for your convenience. You can use our on-line booking form, as well.